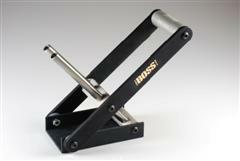 "The Boss" reduces the "pain in the wrist" job of installing hose protectors to an easy pull of the handle. This classy bench/wall fixture is designed with two draw tubes to fit both standard HP and standard LP hose threads. Simply slide the hose protector onto the tube, thread the hose to the end of tube, and pull the handle. "The Boss" mounts either horizontally on a bench, or vertically on a wall stud. When it is not in use, the unit collapses to a 1" high profile. Built to last with an anodized aluminum frame, brass draw tubes, and stainless steel nyloc screws. Features & Benefits: >Slips hose protectors onto hoses with minimal effort. >Applies the force to the fitting, not the hose. >Twin draw tubes that fit both 3/8"-24 (LP) and 7/16"-20 (HP) hose fittings. >Mounts horizontally on the bench or vertically on a wall stud. > All pivot points insulated with frictionless washers. > Anodized aluminum frame and draw bar assembly. > Brass draw tubes and fulcrum. > All screws are stainless steel with nyloc inserts. > Two base mounting holes, screws included (zinc plated steel).